Ground floor: Open plan living/dining room (Sat TV, DVD, WiFi) with doors to covered terrace. Kitchen (oven, microwave, dishwasher). Inner hallway. Double bedroom (A/C). Two twin bedrooms (each with A/C). Bathroom. Shower room. Outside: Open and shaded terraces. Dining terrace. Barbecue. Table Tennis. Poolside shower. Utility room (washing machine). Private parking. Private swimming pool (9m x 4m) with Roman steps. Ca’n Biel is a wonderful addition to our portfolio. Completely remodelled and refurbished to a high specification in 2016, the house sits in a quintessential Pollença location; ostensibly rural, with lovely views across to the Puig de Maria and the Tramuntana foothills, you are at the same time within easy distance of the excellent restaurants and comprehensive amenities of the delightful old town of Pollença along with several gorgeous sandy beaches. There is a lovely, welcoming air about this house, the scene being set immediately on arrival by a long covered front terrace which is, quite simply, an irresistible invitation to relaxed al fresco living. To one side, comfortable outdoor chairs and a coffee table provide an appealing venue for an afternoon siesta or maybe pre-dinner aperitifs before moving across to the opposite side and enjoying the fruits of the barbecue around the dining table. A direct view across the garden from this terrace conveniently assists parents in monitoring the poolside activities of younger party members. Keeping the interior light and bright, large sliding glass doors lead into the open plan living area where you will find plump sofas, a flat screen TV, limed-oak dining table and a modern fitted kitchen with an excellent range of quality appliances as well as ample worktop space to assist keen cooks in their culinary endeavours. Off the living area an attractive stone archway accesses an inner hallway and the property’s three bedrooms, each comfortably furnished and with independent air conditioning. A superb choice of restaurants to suit all tastes and pockets can be found in nearby Pollença town (2.5km) and Port de Pollença (4.5km) the latter home to one of the island’s most celebrated and expansive sandy beaches that certainly merits some of your holiday attention. 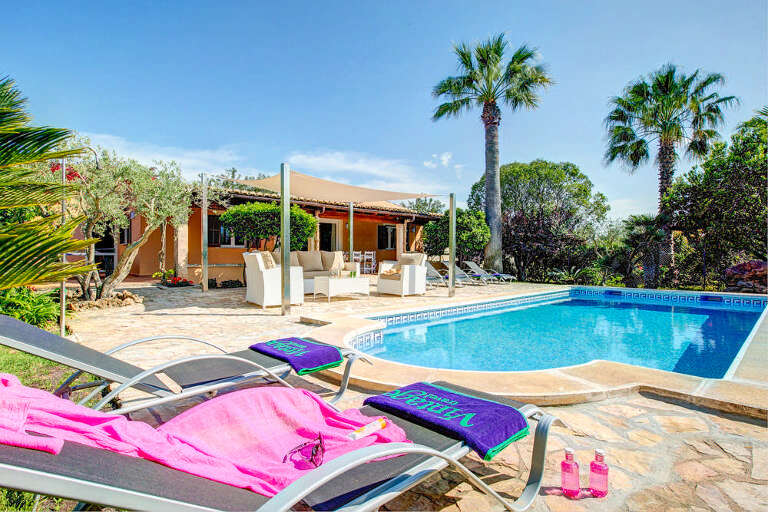 Family-friendly Cala Sant Vicenç (9km) offers two appealing cove beaches and a further choice of excellent eateries while ramblers and cyclists have a large selection of both marked and unmarked trails to discover in the surrounding hills and countryside. Golfers can enjoy a round or two at Pollença’s very scenic nine-hole golf course which is just a 10 minute drive or at the (even more scenic!) 18 hole Alcanada course (20 minute drive). Each of these courses also has a recommended restaurant open to all (considered to be a ‘local secret’, Alcanada’s terraced restaurant has a notable reputation for the excellent quality and value of its ‘menu del dia’ ). The owners of Ca'n Biel respectfully request that guests do not smoke inside the property. Air conditioning usage is on a timer (12 hours per day). At Port de Pollença the beach is spacious, has all amenities, parking along the seafront, and if it gets too hot there is a little playground in a small wood for a respite from the sun. This delightful spot has 4 sandy cove beaches where the waters are crystal clear and ideal for snorkelling. There are a good selection of beachside bars and restaurants where a cooling drink or a delightful meal of fresh fish can be enjoyed while overlooking the beach. Stroll around the old town of Pollença. It's definitely worth making the effort to climb the 365 steps up to the Calvary church and browsing in the curious little shops before sitting down to relax with a drink and dinner in one of the many popular restaurants in the pedestrianised squares. A scenic drive will take you to Formentor Lighthouse - the road is quite narrow in places. At the top of the hill out of Port de Pollença, it is worth stopping at the viewpoint to see El Colomer rock. Although the beach at Formentor is not very large, it has clear shallow water ideal for children and adults alike, with some good waters for snorkelling. Go early, with a picnic. There are 3 glassworks in Mallorca open to the public: Menestralia at Exit 35 on the Ma-13 near Campanet; Gordiola, established in 1719, is near Algaida on the Ma-15 near Exit 20 on the Manacor-Palma road; Lafiore is on the Palma-Valldemossa road. You can watch craftsmen working, see the kilns, museum and shop. Mallorca has a great variety of golf courses and the closest to Puerto Pollença is the 9-hole course at Pollença. Aucanada has an 18-hole course with beautiful views overlooking the Bay of Alcúdia. Make your way to the top of Castell d'Alaró - take water to drink as the last part of the journey has to be done on foot. The views from the top are breathtakingly beautiful! On the way down enjoy a meal at the Restaurant Es Verger where they serve tasty roast lamb done in a traditional Mallorcan oven. Drive over the Tramuntana mountain roads via Inca, Lluc and Sóller, taking in the spectacular scenery, stopping at the various viewpoints including the two lakes/reservoirs, and passing through several world-renowned towns of Fornalutx, Deià and Valldemossa, home to famous writers, painters and musicians. Spend a day at the beach between Ca'n Picafort and the area east of Alcúdia, at Ses Casetes des Capellans, where you can enjoy a tasty paella or seafood dishes at one of the beach restaurants while enjoying the sea and sun on a long and sandy beach. where you can buy your locally grown fresh fruit and vegetables, as well as a few souvenirs and presents. Have a look inside the church which is very impressive. The old-fashioned train ride through the mountains from Palma (or Bunyola) to Sóller and back, including the tram to the Port of Sóller through the orange groves and back, and just sitting in the church square in Sóller enjoying a drink and watching the world go by. Discover the marine world’s best kept secrets by embarking on a wonderful adventure through this marine park featuring more than 8000 animals of 700 different species and more than 5 million litres of salt water. You will also be able to enjoy a wide variety of activities which combine education and fun, suitable for all ages.Open daily. Check website for actual opening hours: Palmaaquarium.com or phone: (00 34) 902 702 902. Take the mountain road from Pollença to the Monastery at Lluc. Visit the museum and the chapel - you may be fortunate enough to hear the Blauets Choir singing. Make your way to the huge cross behind the monastery for the fabulous views out to sea. The beautiful Caves of Campanet, found by a shepherd about 100 years ago, are not too far away and worth a visit to see the fascinating stalagmite and stalactite formations. These caves are not too commercialised and visits are on the hour. For the most impressive caves, go to Portocristo on the east coast and visit the Caves of Drach which houses one of the largest underground lakes in Europe. Ornithologists will know about the birdwatching area at the Albufera and Albufereta, where you can see several different species of wading birds, amongst others, especially during the migrating season. Tuesday market in Old Alcúdia is interesting and has a plentiful supply of locally grown fresh fruit and vegetables, then just stroll round the pedestrianised old Roman town where caper plants are growing out of the main massive thick stone walls surrounding the town. The local council offer a free guided tour around the historical centre of Alcúdia old town on Wednesdays and Fridays during the summer months. Visit the local vineyard, Bodegues Ca’n Vidalet, and try a truly local wine. The entrance to this vineyard is on the left about 1.8 kms down the road from the cockerel roundabout towards Alcudia (Ma-2201). If you like bustling markets lining the streets, then Inca market on Thursday is the busiest you will find on the island. However, Sineu market on Wednesday is unusual as it still sells livestock such as goats, sheep, rabbits and ducks. The fresh fruit and vegetable market is up the hill in a smaller square at the front of the church.